ELIGIBILITY: No Purchase Necessary. 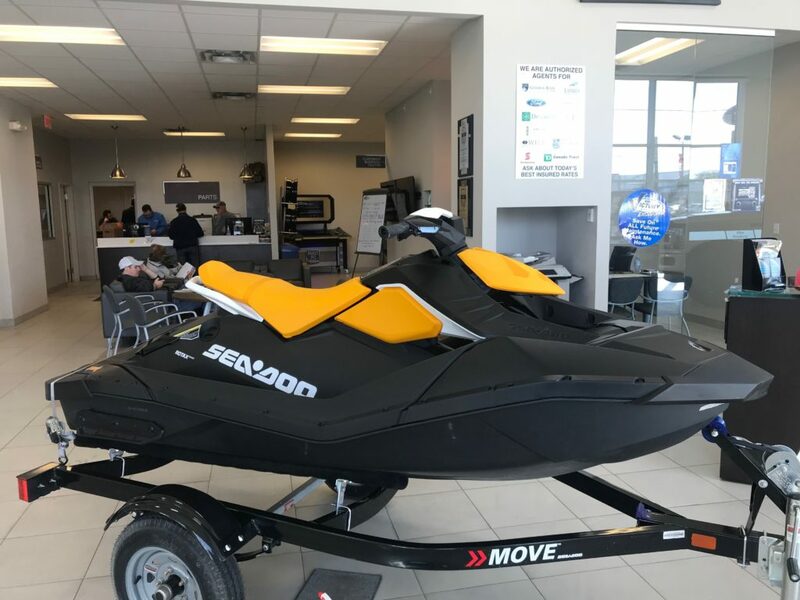 Victory Ford’s Great Sea-Doo Giveaway is open to legal residents of Ontario who have reached age of majority as of the date the giveaway begins. Employees of Victory Ford Lincoln and their immediate families (spouse, parents, children, siblings and their spouses) and individuals living in the same household as such employees are ineligible. Excludes all fleet companies or vehicles registered to a corporation. All previous services and sales will be excluded from the random draw. Promotions starts May 3rd and ends on June 30th @ 11:00am. Entrant must take delivery or have services completed by June 30th @ 11:00am. Random Draw to be held at Victory Ford Lincoln on June 30th @ 12:00noon. Only 1 prize will be available at a value of $8500 consisting of a 2018 Sea-Doo spark and trailer. 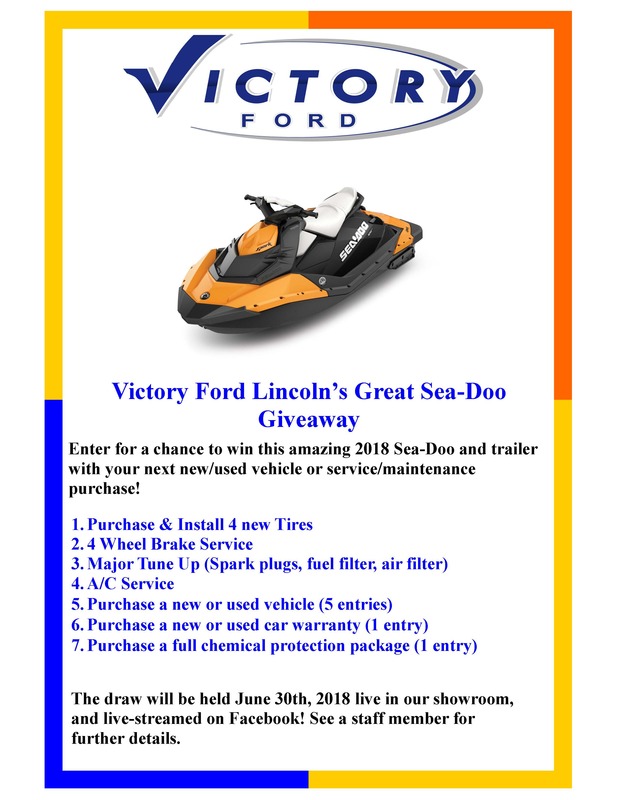 How to Enter: No purchase option requires entrant to fill out form at www.victoryford.ca/seadoocontest form must be printed and mailed to 301 Richmond st e, Chatham, Ontario, N7M 1P8 by the contest deadline. Purchase or lease a new or used vehicle, Purchase 4 wheel brake service, purchase a/c service, purchase and install 4 tires, complete a full tune up. Odds of winning depend on the number of entries. Winner will be required to answer a skill testing question being a mathematical equation without using a mechanical device. GENERAL CONDITIONS: All Entries become the property of the Sponsors. This Contest is subject to all applicable federal, provincial and municipal laws. The decisions of the Sponsors with respect to all aspects of this Contest are final and binding on all entrants without right of appeal, including, without limitation, any decisions regarding the eligibility/disqualification of Entries and/or entrants. By participating in this Contest, you are agreeing to be legally bound by the terms and conditions of these Rules. The Releasees will not be liable for: (i) any failure of the Website or Application during the Contest; (ii) any technical malfunction or other problems relating to the telephone network or lines, computer on-line systems, servers, access providers, computer equipment or software; (iii) the failure of any Entry to be received for any reason, including, but not limited to, technical problems or traffic congestion on the Internet or at any website; (iv) any injury or damage to an entrant’s or any other person’s computer or other device related to or resulting from participating or downloading any material in the Contest; and/or (v) any combination of the above. The Sponsors reserve the right, in their sole and absolute discretion, and without prior notice, to adjust any of the dates and/or timeframes stipulated in these Rules, to the extent necessary, for purposes of verifying compliance by any entrant or Entry with these Rules, or as a result of any technical or other problems, or in light of any other circumstances which, in the opinion of the Sponsors, in their sole and absolute discretion, affect the proper administration of the Contest as contemplated in these Rules, or for any other reason.